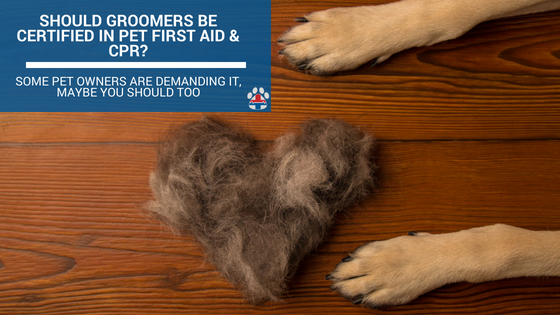 Blog Should Groomers Be Required to Know Pet First Aid & CPR? Pet owners are calling for dog and cat groomers to be trained in pet first aid and CPR. Following the reported deaths at PetSmart that Today.com shed light on back in April 2018, it seems that the wellbeing of pets in professional hands is becoming more and more important to pet owners. With pet care services being the fastest growing sector of pet care businesses according to Nancy Hassel of American Pet Professionals, the increase in pets being owned and therefore groomed is calling for an increase in safety. Recently following the 2018 July 4th holiday, Gloria DeLeon of KFOX14, DeLeon wrote about a discussion from a community meeting in El Paso, Texas, “as the city works to craft a new ordinance for pet groomers, a recommendation was made to require groomers to know how to administer pet first aid and CPR.” This idea was brought about during a brainstorming session in that meeting. Pet owners are paying for services where their pets are being cared for and they expect those professionals providing the service to have the training to handle issues. What is Pet First Aid and CPR Training? Pet first aid is more widely used than it’s titled counterpart, CPR or cardiopulmonary resuscitation (think – heart, lung resuscitation). It literally is the first care given to an animal that has suffered an accident or incurred an injury. Most of us have already provided some form of pet first aid, simply by driving our pet to the vet to seek veterinary medical care or even checking on them when they seem off. The scope of pet first aid ranges and as pet owners and certainly those paid to provide pet services, it’s imperative that everyone knows what to do when something goes wrong – something ALWAYS goes wrong. Yes, you can certainly just drive your pet to the ER vet when you notice something is not right but according to the American Animal Hospital Association, one out of four pets would survive if just one pet first aid technique was applied prior to getting emergency veterinary care. So while you or your groomer can just pop Fido or Fluffy in the car when an emergency happens, they have less of a chance of actually surviving then if you or that groomer you dropped your dog off to had the education to apply proper first aid measures. Proper first aid certification coupled with the know-how of CPR will help to reduce the chance of death, decrease the animal’s suffering, and often reduce the cost of the veterinary medical care. Groomers in the United States do not have to attend training school, they don’t even have to have any training before they can start clipping away at your pet. While there are grooming schools, all are voluntary certifications, meaning nothing is required to allow a person to work with really sharp objects on your pet. That’s a little scary for me to find out and sadly true for many pet care services. Dog walkers, pet sitters, dog daycare workers, cattery staff and groomers are all careers that are unregulated and require no training to dub oneself a professional. This means that if your dog gets hit by a car when the leash slips out of your hired dog walker’s hand or your dog falls off the grooming table and chokes until they pass out, you better hope that both of those people with your pet’s life in their hands have the training to provide life-saving care. Chances are pretty good that they may not. While it’s certainly nice to seek out a pet care professional that has the certification, there is no reason why you as a pet owner shouldn’t have it as well. The pets in our lives survive at our hands, they rely on our knowledge to do what’s best for them. While proving nutrition, a healthy environment, and veterinary care are all essential, there remains a gap in our knowledge as pet owners and clearly with pet care professionals. We have to be these animals’ advocates and know how to recognize as well as act when something is not right – their lives literally depend on it. Bring peace of mind to you and your pets by making certain all of your pet care service providers are certified in pet first aid and CPR – in fact, you should require it in order for them to be your pet’s service provider. If you cannot find a service provider that is trained in pet first aid & CPR, recommend that they take this ER veterinarian certification, it’s a business write-off for the service provider and costs less than a wellness visit to most vets. ***Please disregard the incorrect information given in the KFOX14 video about compressions to breaths demonstrated on the dummy dog in the video posted with the article. The correct ratio is 30 compressions to 2 breaths as developed by the American College of Veterinary Emergency and Critical Care and the Veterinary Emergency and Critical Care Society established the Reassessment Campaign on Veterinary Resuscitation initiative. 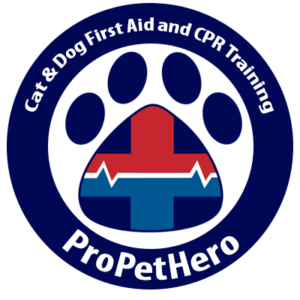 This initiative released evidence-based guidelines for cardiopulmonary resuscitation in dogs and cats and thus recommends the 30:2 compressions to breath ratio that is taught correctly by our ER veterinarian in our ProPetHero pet first aid & CPR course. Below is a video on the correct way to provide CPR to a dog.